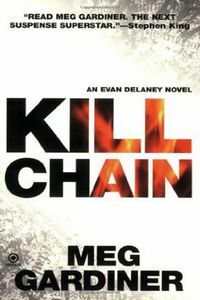 Kill Chain by Meg Gardiner: Synopsis and Online Purchase Options. Synopsis (from the publisher): When Evan Delaney's father disappears, the cops think he's fled the country to avoid prosecution. But Evan is sure he's been abducted or killed for reasons associated with his work for Naval Intelligence. As Evan hunts for clues, she's attacked by an armed man. The attacker ends up dead--and turns out to be a federal agent. Now Evan is on the run, implicated in his murder. And then she's contacted by a sinister duo--a madam and gigolo mother-and-son team who claim her father was mixed up in their very dirty business. Can Evan save her father's reputation--and his life? Evan's suspicions of something sinister are confirmed when she receives a call from her father's kidnappers. The ransom isn't money, but more of a puzzle—one that Evan has only 72 hours to piece together, as she follows a madman's trail into the very heart of darkness.